Neither my partner Ben nor I actively celebrate Christmas. We prefer to hide away from the crazy world that Christmas has become and endeavour to find ourselves as far away from humanity as we are able. Previous years Christmas avoidance techniques have seen us winter climbing on a mountain in Snowdonia, snowed in in a bothy on an off-grid peninsula in Scotland and searching for Narcissi in the driest parts of the highlands of the Negev desert. Last year we found ourselves, on Christmas day, in a little explored valley on a mountain in South Africa; an adventure that I will tell you about forthwith. 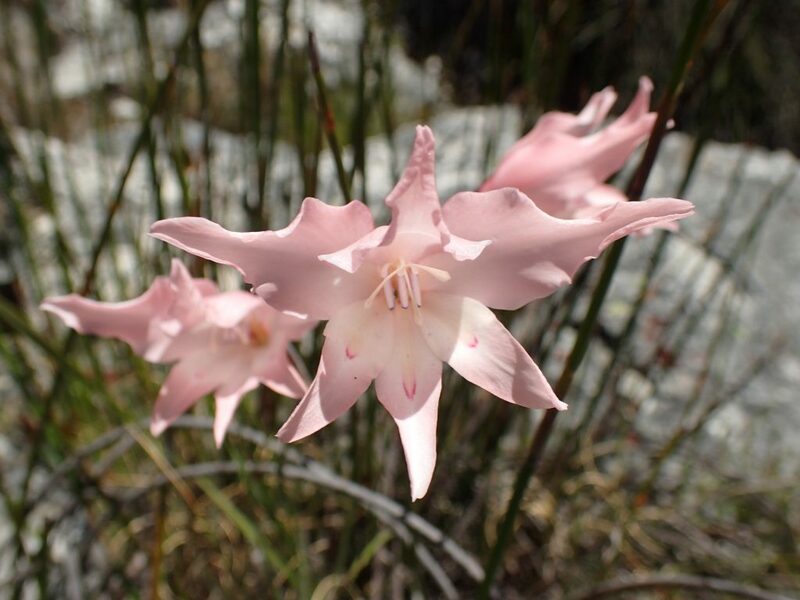 We had just come back into Stellenbosch from a few days hike in the mountains that had seen us, after quite a scary ridge scramble, discover a new population of critically rare Gladiolus rhodanthus (a story for another time maybe). Almost as we were driving into the city centre, we got a call to come to the office of Stellenbosch Botanic Gardens’ curator. ‘I am sorry to be in a rush’ Martin exclaimed ‘but you will need this map and magazine article before I head off for the Christmas break’. Martin allowed me to photograph the relevant documents before dropping a pin in a blank patch of a google map, chivvying me out and locking the door behind us. We had been issued a hand drawn treasure map, and with it a mission had been set to hunt for the rarest of lost jewels. We went to bed that night weary from the events of the previous 24 hours and needing an easy day the next, so we decided our treasure hunt would be best left for the 25th December. This seemed like just the way to avoid Christmas. Christmas eve was spent searching for the needle leaf Feather bush (Aulax pallasia) which was certainly not a taxing experience. We found it growing in a stand of vegetation that had burned just a couple of years earlier. Its vivid golden leaves re-sprouting from in-between its jet black, old flowering stems. The whole landscape was full of bright flowers and the diversity of species incomprehensible. It felt like the lid of a treasure chest had been opened to reveal its contents to us. The next day, Christmas morning, and it was time to get up. We had no idea what the day would bring so an early start, to allow for all eventualities, was necessary. We drove up through the Franschoek pass in the sombre dagian light and parked our car in a little carpark at the entrance to the Mont Rochelle Nature reserve alongside a large stand of Sapphire blue Aristea major. 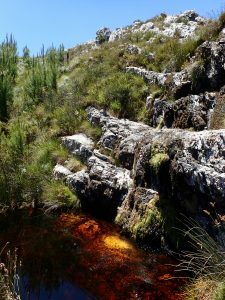 Our quick step down the slope towards the rushing water of the Dutoitsrivier was so very welcome in the knowledge of the uphill ascent that we would have to endure once we had crossed the tannin stained waters of this frog filled brook. 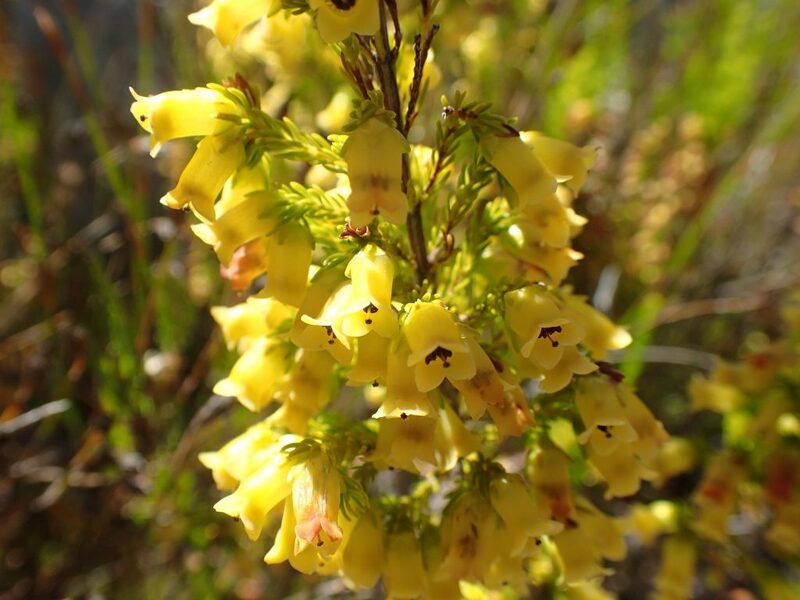 The mid-summer sun was rising above us and the vivid fynbos colours were starting to assault our morning eyes. Citrine flowered Leucospermum conocarpadendron came as a welcome surprise as we sweated up the steep, stepped slope. Growing at the absolute edge of its range we were bemused to find it here and at such high altitude for a lowland growing species. On we went up and up, little rest in the form of flat land came our way as we wound the narrow path. Small cobalt Moraea sparkled from the brown topaz restios as we indelicately tramped through them and occasionally a clump of Erica coccinea would stand out from among the silver rocks like fire opals. But as we climbed higher and higher towards where we thought the map lead us the flowers became fewer and further between. At nearly 1500m in altitude we reached the short, coarse, restio dominated snowfields and water catchments that can be found along the back sides of the high ridge lines of South Africa’s cape fold mountains and we knew that this was where we would need to leave our path and head across country. 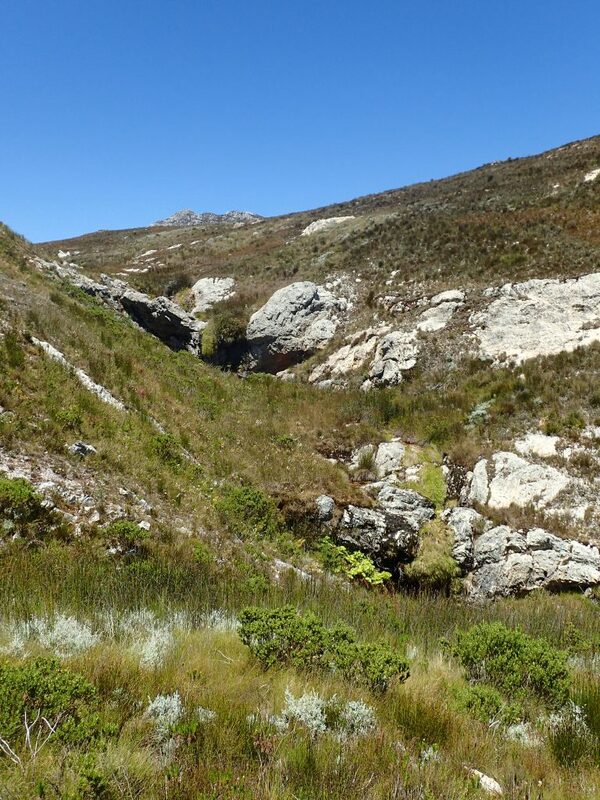 We needed to drop down into the next small valley to search its streams and kloofs to find the precise location of the specific gem we were hunting for. Disa orchids are a group of about 180 species found throughout Africa, the Arabian Peninsula, Madagascar and Reunion Island. …..
Whilst, like many other Orchid genera, in cultivation they readily hybridise only on four occasions have hybrid Disas been found naturally. Disa × maculomarronina (D. hircicornis × D. versicolor) (S. Africa)..
Disa × nuwebergensis (D. caulescens × D. tripetaloides) (South Africa, Cape Prov.). Disa × paludicola (D. chrysostachya × D. rhodantha) (South Africa, KwaZulu-Natal). It was the first of these South African hybrids we were hunting. Discovered 1985, and last seen in 1986, Disa × brendae was stumbled upon by the last people to manage to push all the way into the kloof we were now stood in, Brenda Anderson (for whom it is named) and Dave van der Merwe. Its parents, D. uniflora and D. caulescens, being two of the most commonly known and grown species of Disa. These two species had also been used to create the very similar looking man-made hybrid Disa ‘Linda’ by Mr H. Mayer. Mid way between its two parents D. × brendae shares the large wing shaped petals, maroon linear markings on its petals, upward protruding viscidia and its corymbose grouping of unopened buds with Disa caulescens whilst its scent and inferior pointing conical spur were attributed to uniflora. Its overall flower size was evenly mid-way between the two. This combination of traits, and the flower size leaning towards one of the largest within the genus, made it an alluring quarry for us to try and track down. Everything had stacked up for this to be a successful hunt. The weather was good, the location not so far from our accommodation in Stellenbosch and the plant had last been seen in flower (‘18 well developed spikes, 16 of which were open’) on the 23rd December, 1986. We reached our valley destination and made our way down stream first, walking to the point where the water dropped off an impassable cliff. We then started picking slowly through olivine moss and tall emerald restio interspersed with runnels of amber water. Every so often a large alabaster flower shone out from the banks amongst the peaty soil and sphagnum and our hearts would stop for a split second until we ascertained it was just another one of the beautiful Gladiolus (possibly G. carneus) that had made this valley their home. It was when we reached about half way along the valley floor that we started seeing the Disas. 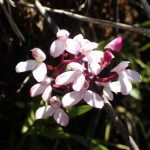 On the edges of the little streams and hanging from waterfalls that flowed merrily down small offshoots into the main kloof Disa caulescens was there in full flower. We decided given the abundance of one of Disa × brendae’s parents that each of these little tributaries should be checked for Disa caulescens’ hybrid offspring. Slowly, battling through, sometimes thick, vegetation we pushed our way up the, steep, slopes of each of the small streams looking for anything that resembled the small cliff that it had originally been described from. 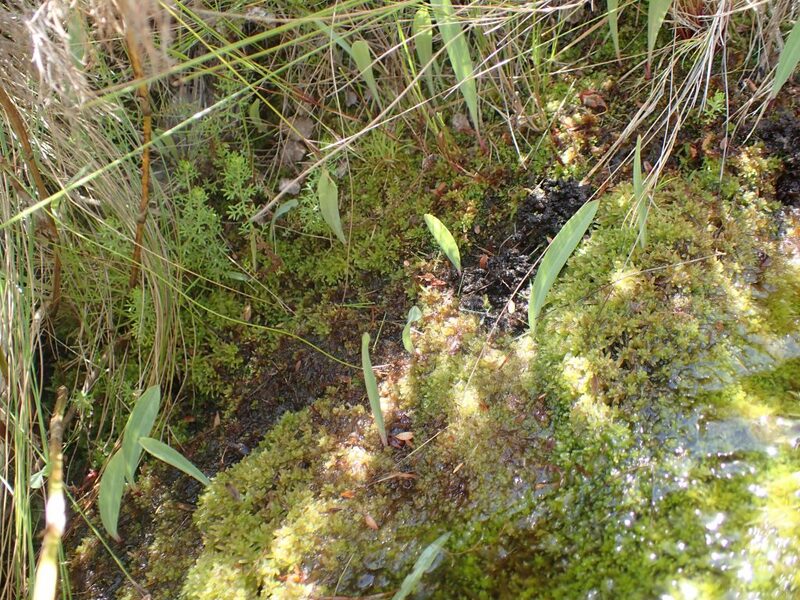 We climbed each one until we reached the point from which the water gurgled out from its sphagnum home. Then, crossing to the next, we worked our way down zigzagging and constantly searching for the pink diamonds we had been sent here to find. 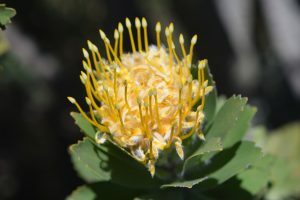 In the margins of one such stream we found a swathe of jasper ericas, as yet without identification, and at the foot of another the rose gold crowns of a lone King protea. Every so often we came across an invader in the little valley in the form of pine trees that had escaped from the lower plantations of Franschoek. As we made our way further up the tributary of the Dutoitsrivier these unwanted mountain outlaws steadily increased in number until finally we reached their base in the bowl created by a small waterfall. Initially we had tried battling them, chopping them down when we saw them, but as their numbers grew stronger, we just had to push through them when they stood in our path. A menace for the mountain’s ecosystem, their presence was more than alarming in such a remote and beautiful spot. Finally, we had pushed to the very top of the little kloof, beyond the pine ridden waterfall lay snowfield catchment and restio heath, a harsh environment for delicate fynbos gems. Yet we had not seen anything of Brenda’s orchid. There was one last little trickle of water to check, tinkling through a barricade of dead pine trunks and thick spiny scrub. We pushed our way in to this closed off rill, delicately trying not to fall through the moss into the deep cleft that the water had created. Inching our way, desperate for any sign that an orchid may be there. Then, just as hope was fading, jade green tongues showed themselves from among the etiolated moss that had been totally shaded out by the dense vegetation above it. Not many of them, but larger than those of the Disas in the valley floor. Could this be it? The only location for Disa x brendae? Alas, there was no flowers to be seen that would confirm our find. The fynbos here had not burned in a significant period. Long enough indeed for two generations of pines to establish. Our hunt it seems, despite the promise, had been scuppered by nature herself. For the time being it seemed she was going to keep these most precious of gems for her own gratification. We photographed the spot, made GPS records and collected detailed information about the site and then retreated leaving the valley to its pine outlaws, Gladioli, Ericas and its solitude high in the mountains. We will wait, until the overdue smelting of the landscape spreads through the spot and then, maybe, we will return, or send others, to see if nature has decided to reveal the secret home of Disa × brendae to us by allowing her pink diamonds to sparkle again in their fynbos treasure chest for Christmas. With thanks to Stellenbosch municipality and Mont Rochelle Nature Reserve trustees for allowing us full access to the Mont Rochelle Nature Reserve. Thanks also to The Western Cape Nature Conservation Board (CapeNature) for our permits to collect within the Western Cape and Martin Smit of Stellenbosch University Botanic Gardens for all the support and assistance. Further thanks to the RHS Blaxhall Valentine Bursary Fund for their financial contribution without which we would not have been able to make such a expedition. Anderson, B and Van Der Merwe, D. March 1986. 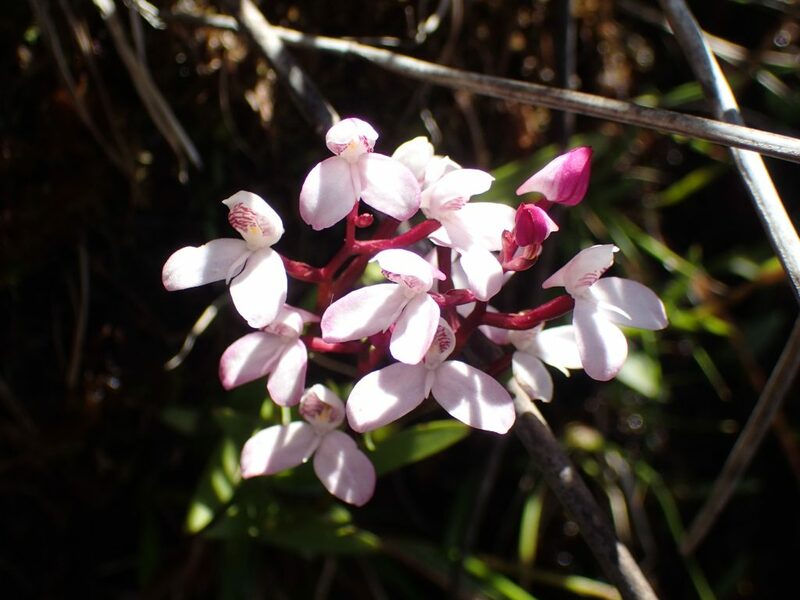 A new natural <i>Disa</i> hybrid, Veld and Flora, the Botanical Society of South Africa.